Every couple above everything else, wish for never lasting love in their relationships, as it is love that forms the true basis of happiness in their lives. But why, despite of best intentions and efforts, not every couple gets to enjoy a relationship that is wrapped in the sweet emotion of love. Well, the answer is simple: Non Compatibility. 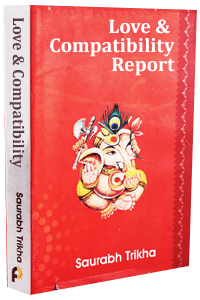 The Premium Love and Compatibility Report gives you access to an exclusive consultation with our expert astrologer. You can ask a question of your choice and we’ll send you a penned down version from our astrologer, along with a complete Compatibility Horoscope Report in a colored printed book format. A personalised answer to your question from our expert. I was getting battered by life from all sides and there seemed no respite, but that was until i took this amazing personalized report.All my problems are long gone.People around me are simply amazed.Thank you for changing my life! I was getting battered by life from all sides and there seemed no respite, but that was until i took this amazing personalized report.All my problems are long gone.People around me are simply amazed.Thank you for changing my life!